In this episode Dr. Heiser talks to the men behind a new translation project, John Hobbins and Samuel Bray. 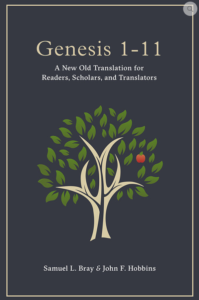 The first volume of their effort is entitled Genesis 1-11: A New Old Translation for Readers, Scholars, and Translators. Our discussion focuses on the translation enterprise – what translators need to think about as they do their work. The strength of this new project is its thorough documentation by the translators of what and how they were thinking during the process of producing their translation. Over 130 pages of notes about the Hebrew text and its translation issues accompany the translation. The work comes highly recommended, and Naked Bible Podcast listeners can purchase the resource at a discount. Preorder HERE and use the code: GETNAKED to receive a discount.